Every school I know offers a summer camp. Sometimes, these are for just their students but often, the community is invited in an effort to provide a safe, fun summer learning environment for all kids. The biggest problem with summer camp has nothing to do with picking interesting subjects or lining up teachers. It’s organizing enrollees. JotForm has the camp registration solution. If you’re not familiar with JotForm, it is the gold standard for form creation whether on PCs, Macs, or mobile devices. 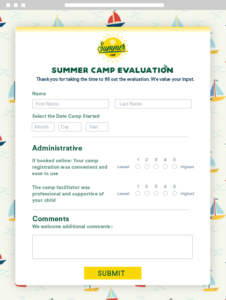 For your summer camp, it can be used to sign up volunteers, get feedback on events, enroll people into classes, collect payments, and more. Its drag-and-drop interface makes building a form intuitive, and quick. With a wide variety of summer camp-themed templates, it’s easily adaptable to your school or camp colors and logo. Once the form is completed, it can be shared via a link or social media, or integrated into DropBox, Google Docs, and many other popular platforms. 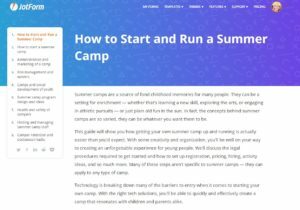 When you’re ready to create the registration forms, start by browsing JotForm’s many summer camp templates. Some are generalized signup forms while others are specific to camp needs such as a medical form, evaluations, arrival details, and more. Once you’ve selected your look, dragging-and-dropping the basics (like contact information), customizing fonts, and adding images takes only minutes. Beyond that, you can include additional pieces to customize the form to your needs such as payment, discounts, medical records (because JotForm is HIPAA compliant), arrival details, dietary preferences, evaluation, the collection of waivers and permission slips, and feedback–even audio comments from enrollees. JotForm partners with the leading online payment platforms such as Stripe, PayPal, and Square. It’s even easy to add extra services parents can include in their child’s enrollment like special tutoring or events. And if you’re creating this form with a team, a click of a button adds collaborators. When you’re done, share the link through email or social media, embed it to online locations, turn it into a QR code, or save it as a PDF that can be sent to interested individuals and signed electronically. It can even be shared through a variety of 3rd party platforms like WordPress, Blogger, Tumblr, Shopify and over a dozen more. Responses are either stored in your response folder or populated into Google Sheets. 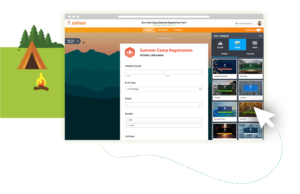 Whether you’re a camp, a nonprofit, or an educational institution, you want summer camp registration to be easy, comprehensive, reliable, and intuitive. You could use another form builder but none offers as much, as dependably, and as flexibly as JotForm, so why would you? Highly-versatile, Easy-to-use Form Creator–and it’s free! –This is a sponsored post but opinions are my own. Know that I only recommend products or services I believe will be good for my readers and are from companies I can recommend.